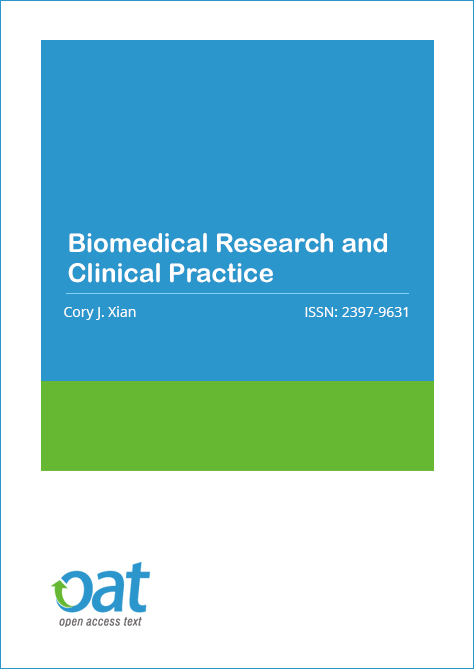 Biomedical Research and Clinical Practice is an open access journal with comprehensive peer review policy and a rapid publication process. Biomedical Research Journal is a novel journal that will focus upon the latest developments in medical research and associated disciplines. Biomedical Research Journal will provide an extensive coverage on physiology, biochemistry, microbiology, clinical and medical engineering and computational aspects related to biomedical sciences. Biomedical Research Journal aims to disseminate information on physiology, biochemistry, clinical chemistry, biomedical engineering, biomedical informatics, genetics, biophysics, system biology, mathematical medicine, cell biology, molecular and structural biology, developmental biology, pathology, geriatrics, hepatology, hematology, microbiology, immunology, infectious diseases, dermatology, preventive medicine, nephrology, neurology, endocrinology, oncology, ophthalmology, orthopaedics, personalized medicine, pharmacology, radiology, nuclear medicine, regenerative medicine, rehabilitation, toxicology, dentistry and oral surgery with an emphasis on medical/clinical significance. Biomedical Research Journal renders a global platform for academicians and researchers to share their work in relevant fields of biomedicine. Biomedical Research Journal will feature original research, review papers, clinical studies, editorials, expert opinion and perspective papers, commentaries, and book reviews. Copyright is retained by the authors and articles can be freely used and distributed by others. Articles are distributed under the terms of the Creative Commons Attribution License (http://creativecommons.org/licenses/by/4.0/), which permits unrestricted use, distribution, and reproduction in any medium, provided the original work, first published by Biomedical Research and Clinical Practice, is properly cited. *2019 Journal Impact Factor is the ratio of the number of citations achieved in the year 2018 based on Google Search and Google Scholar Citations to the total number of articles published in the last two years i.e. in 2016 and 2017. Impact factor measures the quality of the Journal. If ‘X’ is the total number of articles published in 2016 and 2017, and ‘Y’ is the number of times these articles were cited in indexed journals during 2018 then, impact factor = Y/X. Dr Nishizawa is serving as Professor at the Department of Clinical Laboratory Science of the Teikyo University School of Medical Technology, Japan. After graduating from the University of Tokyo School of Medicine, Tokyo, and being qualified as a medical doctor in 1989, He started the research at the Division of Medicine, Department of Neurobiology, Institute of Brain Research, University of Tokyo Graduate School, and received the Ph.D. degree (medicine and physiology) in 1994. Although his qualification is medical, his current research focuses on computational biochemistry: biologically relevant processes of interactions between lipid membrane and proteins, ion channel dynamics, transporter dynamics, membrane fusion (viral and intracellular), and other pathological processes. His recent focus is on improving several force fields for molecular dynamics with an emphasis on membrane protein folding, which are of high relevance of current molecular medicine. Prior to these chemical studies, Dr Nishizawa has wet-laboratory experiences in molecular biology of mRNA stability regulation in neuronal cells and T-lymphocyte immunobiology from 1993 to 1998, including his postdoc years at Dana-Farber Cancer Institute, Boston. He also conducted studies in molecular evolutionary genetics using numerical simulations from 1998 to 2002. In 2006, he served as the founding Chief of the Dept of Clinical Laboratory Science at Teikyo University. With a publication record covering computational physical chemistry, neurobiology, immunobiology and molecular evolution, since 2010 he has been serving as an editorial board member of several journals including Journal of Biophysical Chemistry, BioMed Research International, and Computational and Mathematical Methods in Medicine, the latter providing a unique forum for interdisciplinary research between clinicians/experimentalists and theoreticians, focusing on collaborations across biomedical, clinical, and translational research areas. Teaching many students in his courses of biochemistry, clinical chemistry and analytical chemistry, he emphasizes training the next generation of scientists who have ambitions to bridge across diverse medical disciplines. 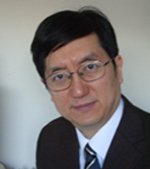 Biography Dr Xian is a Research Professor and NHMRC Senior Research Fellow at University of South Australia. He has more than 25 years of experience in research on tissue growth and repair, growth plate biology and bone growth, bone repair and regeneration, cancer chemotherapy-induced bone defects, and osteoporosis. Dr Xian obtained his PhD in 1993 from Murdoch University; and his earlier research positions include those at Child Health Research Institute, University of Adelaide, Flinders University, and Women’s and Children’s Hospital. Dr Xian has over 140 peer-reviewed publications. Biomedical Research and Clinical Practice is an Open Access journal and we do not charge the end user when accessing a manuscript or any article. This allows the scientific community to view, download, distribution of an article in any medium, provided that the original work is properly cited, under the term of "Creative Commons Attribution License". In line with other open access journals we provide a flat fee submission structure on the acceptance of a peer-reviewed article which covers in part the entirety of the publication pathway (the article processing charge). The process includes our maintenance, submission and peer review systems and international editing, publication and submission to global indexing and tracking organisations and archiving to allow instant access to the whole article and associated supplementary documents. We also have to ensure enough investment to secure a sustainable model which ethically, legally and financially stable. The publication charges for Biomedical Research and Clinical Practice are GBP 2850. "Gut Microbiota and Health – from Biology to Clinics"
Description of the Special Issue: Recent studies highlighted the central role of the gut microbiota in our health and diseases. High-fat-diet as a factor for dysbiosis and for entrance of endotoxin form the gut to the circulation, worsening atherosclerosis, is now known. Prebiotics/probiotics are being attempted in many clinical settings, and characterizations of specific bacterial species for potential usefulness are underway, propelled by technical improvements in metagenomics and in animal models. This special issue aims to widely discuss gut microbiota, from basics such as immunity-microbiota interplay, to pathology of diseases, and to therapeutic frontiers. Improvements of technologies in DNA sequencing and mass spectrometry analysis propelled high-throughput studies in cancer biology. Yet, in clinics only a limited number of genes/proteins are considered as predictive markers, which have primarily been characterized from biological interests in a small science format, suggesting importance of considering strengths and weaknesses of various approaches as a source for prognostic or predictive markers for cancer treatment. In this special issue, studies of any types on gene/protein expression in cancers are welcome. We welcome cases of characterization of specific genes in a conventional way of biological research, but, insights derived from more systematic and integrated, omics-based approaches may be discussed as well. Challenges in bridging these two extremes would become the ultimate theme to be discussed. Consumption of long-chain n-3 (omega-3) polyunsaturated fatty acids (PUFAs) of marine origin, such as eicosapentaenoic acid (EPA) and docosahexaenoic acid (DHA), has beneficial effects on our health in many settings. Reflecting their multifaceted and multilayers functions, research activities related to these PUFAs are diverse. This special issue aims to consider a wide range of studies on long chain n-3 PUFAs, ranging from biological, immunological, epidemiological, and clinical settings, including autoimmune diseases, cardiovascular diseases, cancers, and metabolic syndrome. While their overall anti-inflammatory effects are clear in simpler systems, their clinical translations are often showing no or marginal effects. We welcome not only positive but also negative findings and discussions about controversial subareas. In particular, EPA vs DHA ratio, n-6 vs n-3 ratio, effects showing dependency on age, stage of diseases and genetic factors relevant to fine tuning of supplementation protocols may become central topics of this issue. With the greater success in treating cancers, the focus has now turned to reducing the associated toxicities. Cancer treatment-induced side effects include acute tissue damages such as gastrointestinal damage (mucositis) and bone marrow damage (marrow cell depletion), and chronic side effects such as skeletal damage (bone loss, osteonecrosis, bone marrow adiposity and fractures) and metabolic disorders. These are important issues that can impact significantly on cancer treatment itself (dosage and success), patient hospitalisation and quality of life for patients and survivors. Due to the commonality of the problems (with increasing numbers of cancer patients and/or survivors suffering from these issues) and lack of effective treatments, further work is required to understand the pathophysiology of cancer treatment-induced side effects and to develop therapies for their prevention and/or treatment. The purpose of this special issue is to report advances in clinical and preclinical (molecular/cellular research/animal model) studies into pathophysiology of cancer treatment-induced tissue damage and repair, new treatment strategies for preventing or treating these acute or chronic side effects. Original research or review articles are invited for this special issue.